This is a breakout board that mounts a 74HC4067 which is a 16-channel Analog multiplexer/demultiplexer that can route both analog and digital signals in both directions. 1 of 16 input channels can be routed to 1 output or 1 input can be routed to 1 of 16 output channels. It can handle analog signals such as from analog sensors or a bank of potentiometers or it can handle digital signals such as from switches, digital sensors or even serial communications.The 74HC4067 can operate over the range of 2 to 6V, so it is compatible with both 3.3 and 5V logic. Four address lines (S0-S3) select one of the 16 channels and connects it to the input/output pin (SIG). It uses binary addressing, so address 0000 is Channel 0, address 1111 is Channel 15. When a channel is ON, it has a resistance of about 70 ohms which allows signals to flow both ways. With a 5V power supply, we measured about 60 ohms. Maximum current is 25mA through any of the channels. There is an enable pin (EN) that is active LOW and defaults to that value. When LOW, the device enables the channel selected by the address lines. If EN is pulled HIGH, all channels are disabled. On the electronics module there are 2 rows of header solder points. These can be used to connect wires to or header pins depending on the application. S3 = Binary Address Bit 3. The address bits (3…0) connect to 4 digital output pins on the microcontroller to select channel. EN = Enable. Internally pulled LOW to enable by default. Can be pulled HIGH to disable all channels. VCC = 2 to 6V. Usually connected to 5V or 3.3V to match the microcontroller power. GND = Ground, must be common with the microcontroller. 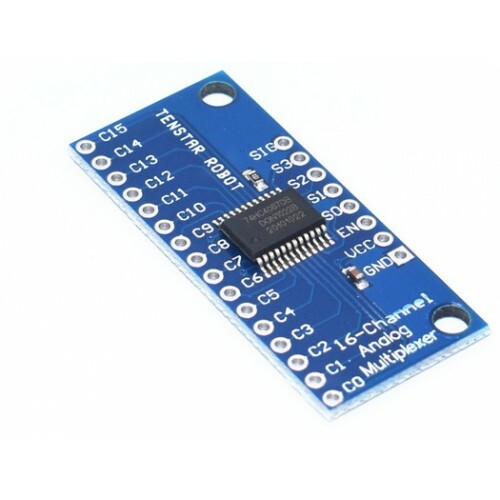 TCA9548A 8-Channel I2C Multiplexer ModuleYou just found the perfect I2C sensor, and you want to wire..